Chesham, UK – 25th May 2017. As the EU’s Artemis EMC2 project draws to a close on 30th June 2017, Sundance Multiprocessor Technology Ltd., an established supplier and manufacturer of embedded modules, has declared its participation a resounding success. Sundance’s role in the project has been to architect and develop the hardware platform on which the project’s applications could be demonstrated. This hardware demonstration platform, which also forms the basis of Sundance’s commercially available EMC2-compliant PC/104 product portfolio, has now been placed in the public domain. EMC² – Embedded Multicore systems for Mixed Criticality applications in dynamic and changeable real-time environments – is a €94 million project involving around 800 man-years of effort with 101 partners from 16 European countries. The objective of EMC² has been to establish multicore technology in a diverse range of embedded systems domains by finding solutions for dynamic adaptability in open systems, handling mixed criticality applications under real-time conditions, with flexibility and scalability, and delivering full-scale deployment and management of integrated tool chains, through the entire product lifecycle. The EMC² project was structured into 12 Work Packages comprising six Technology Work Packages covering the technical developments and six Living Labs focusing on applications. Sundance’s principal involvement was in Work Package 4 (WP4) dealing with multicore hardware architectures and concepts. Sundance has worked closely with CERN to place the design of the EMC2-DP hardware platform into the public domain using CERN’s Open Hardware Repository (http://www.ohwr.org). Launched in 2009 and following the philosophy of the free software movement, CERN set up the Open Hardware Repository to enable electronics designers at experimental physics facilities and elsewhere to collaborate on open hardware designs. Sundance’s EMC2-DP platform design can be found on the CERN Open Hardware Repository at http://www.ohwr.org/projects/emc2-dp/wiki. As a consequence of its involvement in the Artemis EMC2 project, Sundance has added a range of commercially available EMC2-compliant products to its portfolio of PC/104 form factor single board computers and carrier cards. These include board variants that utilize the Xilinx Artix-7 and Kintex-7 FPGAs and Xilinx Zynq SoC for I/O interfacing and processing as well as a carrier board for Trenz FPGA and SoC modules. 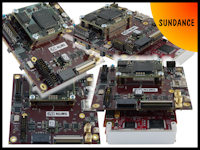 Details of these Sundance products can be found at http://www.sundance.technology/som-cariers/pc104-boards/. “Already, real and practical applications are beginning to emerge from the Artemis EMC2 project, including a smart camera application designed to determine train positioning in real time by capturing trackside information at fixed intervals at up to 300 km/h,” concluded Flemming Christensen, Managing Director of Sundance Multiprocessor Technology. Sundance designs, develops, manufactures, and markets internationally high performance signal processing and reconfigurable systems for original equipment manufacturers in embedded applications. Leveraging its multiprocessor expertise and experience, Sundance provides OEMs with modular systems as well as data acquisition, I/O, communication and interconnectivity products that are essential to multiprocessor systems where scalability and performance are essential. Sundance, founded in 1989 by the current directors, is a member of the Xilinx Alliance and MathWorks’ Connection programs. Sundance is also a member of the PC/104 Consortium, the focal point for the entire PC/104 industry including manufactures and OEMs. It provides a place for information on current specifications, product offerings, news, and events and a place to advance and develop specifications that are consistent and stable for long-term use. For more information about Sundance Multiprocessor Technology and its products, visit http://www.sundance.com. All trademarks are recognised and are the property of their respective companies.